Whenever I mention energy therapy or energy healing, I am discovering more people who have heard of it or are interested in learning more. It is not seen as woo woo or taboo anymore. Although there are those who believe that only healing can come through pharmaceuticals and traditional medicine, there is a growing population who know the power of energy therapy. And in recent years, there has been a growth in energy therapy to benefit animals. I specialize in helping companion animals experience physical and emotional wellbeing through energy therapy. I have spent my career as an attorney. I am trained to ask for proof and evidence before I believe something; I am open-minded and analyze new information before I form a belief. I can tell you from my personal experiences and training that energy therapy does work and research studies are now backing up those claims. Since I began my energy training in January 2008, I have been providing energy therapy to my own cats and to the feline residents at King Street Cats, a cat orphanage where I have volunteered for many years. 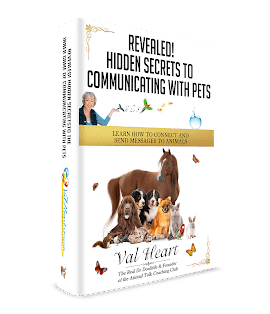 This article will share with you the amazing gifts that energy therapy can provide to companion animals. So what is energy therapy? It comes in all different forms, but in its basic terms it involves channeling a higher source of energy to provide healing. Some people tune out as soon as I mention a higher source. But I think most people can agree, regardless of religious affiliation, that there is some higher power that governs our Universe. We are discovering that there are different layers and sources of energy and when you are attuned to this energy, you can connect with a healing source. Energy therapy is subtle. Anyone who expects an immediate cure or cessation of symptoms may be disappointed; however, there will most often be an immediate shift in physical, emotional or mental wellbeing. For most, there is a tingling sensation as the energy travels through the body to eliminate energy blockages. While I have seen immediate changes in a companion animal’s physical and emotional state during an energy therapy session, the most benefit comes from consistent and repeated sessions. Because healing at the physical or emotional layer may be deeply embedded in an animal, one session will start to release the issues and instill wellbeing but may not completely resolve the issues. And if an animal is exposed to an environment or situation that is causing physical or emotional stress, or is recovering from such an environment, several or repeated sessions may be needed. Energy therapy does not necessarily provide a cure to an ailment; instead, it allows the body (both human and animal) to relax to the point where the body can heal itself. The energy allows for the body to achieve the highest healing available, even if that does not mean getting better. So if a companion animal does not get well after energy therapy, the companion animal may not be in a position to have full healing, yet will experience healing in other ways. I am certified in Usui Reiki, Integrated Energy Therapy and Crystal Healing and will share how I have incorporated those techniques with companion animals. Reiki is a Japanese healing modality that means universal life energy. This technique promotes relaxation and balances energy at the physical, emotional, mental and spiritual levels. During a Reiki session, the animal must consent to receiving the energy. So I look for the animal to sit within my hands or nearby to receive the energy. If they walk away, I end the session. A Reiki session with an animal can occur by hovering hands directly over or lightly touching the animal, sending the energy from a small distance, or even sending energy from a greater distance (across the globe) and to time in the past or future. Energy knows no space or time boundaries, so healing can be sent anywhere to any time. Companion animals are highly attended to energy, therefore even a short treatment can result in visible significant relaxation. I have even had a few companion animals snore in delight as they soaked in the energy. Reiki can be particularly beneficial for companion animals in shelters who are not accustomed to being in a cage or kennel, hearing the sounds of other animals, or being away from a home environment. The relaxing energy can help the companion animal relax and show their personality, which optimizes their chances for adoptions. Integrated Energy Therapy is an angelic energy that gets the issues out of tissues. IET supports humans and animals to release limiting energy patterns and blocks from the past while balancing energy at the physical, emotional, mental and spiritual levels. IET is a gentle energy that works directly with the 12-strand DNA and focuses on specific integration points on the body. Each integration point relates to an emotional issue, such as fear, stress, powerlessness. When the emotional issue is released, physical healing is able to occur in that area. I incorporate IET with a companion animal when there is a specific physical or emotional ailment that needs assistance. For example, repressed stress can cause stomach and digestive issues. I recently became certified as a Crystal Healer and have found that animals resonate beautifully with the healing energy of crystals. And the science behind crystals is fascinating! Crystals have a set dominant oscillary rate (a vibration), whereas humans and animals have a variable rate that changes with our environment. When a crystal comes into contact with a human or animal’s energy field, the energy field of the human or animal will sync to the rate of the crystal. So if you are holding a Black Tourmaline crystal (a grounding stone), your energy field will begin to sync to the healing energy of the crystal and you will feel calmer and more grounded to earth. And because crystals outwardly vibrate their energy (the larger the crystal, the wider its range), placing crystals around animals will also provide healing. Simply being in a room with crystals or laying crystals around your pet as they lay or sleep will provide a benefit. Check out the Manifested Harmony You Tube page to see the benefits of crystal healing with cats. Since 2008, I have been conducting energy therapy sessions with my own cats, client’s pets, and with the residents of a cat orphanage where I volunteer. Here are some examples of how energy therapy has helped. In 2009, my beautiful Flame Point Siamese cat Sammy was diagnosed in the early stages of kidney failure. Having just learned Integrated Energy Therapy and being taught that fear resides in the kidneys, I pondered what would be causing fear in Sammy. After a few weeks, I realized that around 2008, Sammy lost his hearing. His world went silent and that must have been fearful for him (especially when his feline sister, Lucy, would jump out of no where to scare him). In energy therapy, we also learn that animals may take on a physical ailment of their person to lessen the impact. I started giving IET to Sammy and focusing on his kidneys to remove the fear. He also loved to soak up Reiki every evening as he would lie on top of me and relax. I also started conducting sessions on myself because I was undergoing some stress and fear in the workplace. While I never expected to reverse the kidney failure, and knowing that no person or animal is immortal, I simply wanted to extend his life for as long as possible and provide good quality of life. I hoped that the energy therapy would relax his body and energetically remove some of the energy blockages in his kidneys. Although Sammy passed away on February 24, 2012, he lived a higher quality and longer life than I had anticipated. In the final weeks before his passing, I surrounded him crystals to help him be at peace with his eventual passing. I attribute his longevity to high quality food, fluids for the final five months and to energy therapy. I volunteer at King Street Cats, a free-roaming cat orphanage in Alexandria, Virginia and have many opportunities to engage in energy therapy on cats who have been abused, neglected, abandoned or have behavioral issues. Recently, I have been incorporating crystals into my work. For newcomers who are initially housed in a comfortable cage until they adjust, these cats may be frightened or depressed over losing their home. We find that older cats suffer from depression or anger after losing their home. To help calm them and regain their true sense of self, I have been hanging organza bags with crystals on the cage doors. In April 2012, we welcomed Tommy who was rescued from a hoarding situation. He was timid and nervous to come out of his cage, yet showed interest in coming out but lacked courage. Tommy is a beautiful and smart boy who tilts his head to the side when you talk to him. I hung a bag of Aquamarine (for courage) and a Clear Quartz Crystal (to amplify the energy) on his cage. After a week, he showed progress and was moved from a cage in our intake room into the main free-roaming room where he is now mingling with the other cats and playing. To help share crystal energy throughout our orphanage, I worked with two of my students (who are also volunteers) to hang Rose Quartz (to heal heartache) and Selenite (to calm the environment) from the ceiling to radiate out to all of the cats. For cats who are struggling with significant behavioral or health issues, I am also providing crystal charms to hang on their collars.